I would also really appreciate it if you shared this post your friends. To do that, just copy the link to this page into your status, or go to The Facegamer Fan Page, find the appropriate picture and click “share”. Thanks! 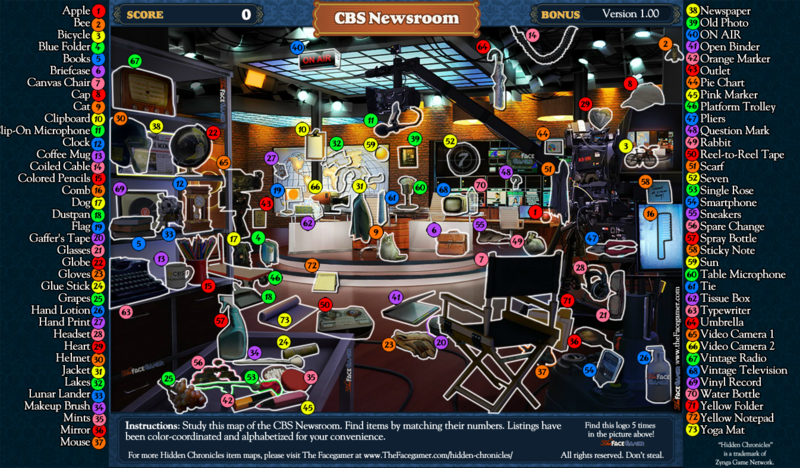 Here's the map to every item in the CBS Newsroom FASTFIND level. To see it FULL-SIZED, click on the image. I hope you like this. Please let me know in the comments which map you’d like to see next! Video Camera 1 is now the Teleprompter. Video Camera 2 is now just the Video Camera. Thanks! I tried to record the show, but the power had other ideas. Let me tell you what an angel you are helping us with the link. I tried to watch Big Brother last night 2x but both times fell asleep. I want to tell you that I appreciate you doing this and what a great help this is. God Bless because after all I DO NOT watch Big Brother period, never have and never will. Thanks again. qual é o link para desbloquear a cena do big brother? Thank you for the link to get the CBS Newsroom. I missed the link the 1st time, they I re-watched on CBS.com and did not see it. can you please send the big brother link dont watch that sore of tv. Thanks very much. I live in Egypt so could not see the show. Milles merci pour moi qui ne parle que le français et qui n’a pas pu trouver l’émission. Alguem poderia me enviar o link para concluir a sena por favor!!!!!!! Thank you! I watch the show but did not see the url. Honestly I would love to have one of the beach scene or king tuts tomb or even stagecoach. If you need help with spring egg hunt I could try and help thought you’d have to tell me how. Thank you so much for this Link, you are truly a godsend. I am in your debt. I can not find the scene to do either. could someone please tell me what tab in the manor to find it. I have looked thru all and still do not see it. Thanks a lot for the link!! you´re very nice and kind. Kudos from Venezuela! Thanks for the link. Taped the show but was unaware of the short timeframe for claiming the prize. Your link really helped out! poderia me enviar o link…. gracias!!!!! ok, what is the link?? I watched the show but missed the link. Is there another way to get the link? I wish we had a map of the beach scene-even after months I still have trouble with that one. As for the link=I watched the show as I always do and somehow missed the link. Now according to what I just saw on your site the link doesn’t work anymore. Hopefully we can get it some other way. Thanks for all you do!